While a wide variety of skills and processes are involved in the crafting of our metalwork, four primary areas are key: forging, repoussé, joinery and finishing. Forging is what most people imagine when they think of blacksmithing. Visions of the old village smith wielding a hammer, striking a red hot piece placed on an anvil, aren’t particularly far off. 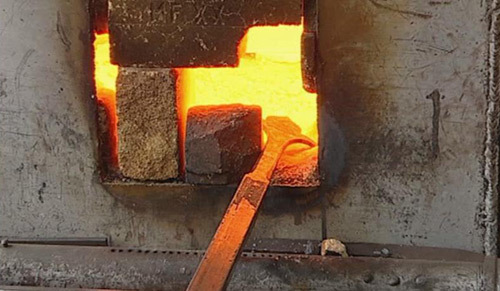 Technically, forging involves heating metal, until plastic, then using force to change its shape. Forges (furnaces), either coal or gas fired, or occasionally oxy-fuel torches, are used to heat the metal to temperatures up to aprox 2300°F. The metal is then shaped by striking it with a hand hammer or by using pneumatic or mechanical power hammers or presses. Careful attention and a high degree of skill are required to transform the metal from bar or plate to the desired geometry. 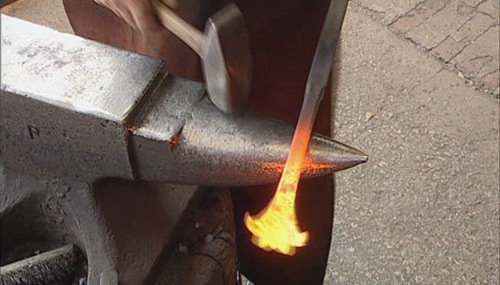 While shaping the metal, the blacksmith must also create the forged texture specified by the design. Repoussé is a process by which depth, detail and fine elements are added to the piece. 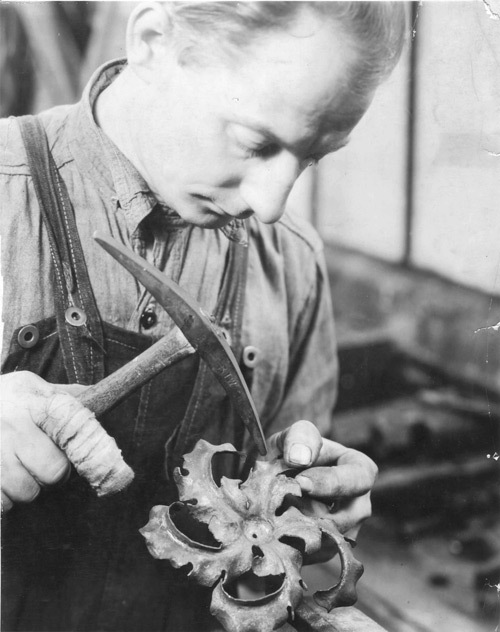 It is the labor-intensive technique of hand hammering cold, thin pieces into and onto forms. It also involves adding contour to three-dimensional pieces and adding depth to bas relief forms. Using repoussé one can make everything from simple, bold parts to exquisitely fine detail. Rosettes, leaves and husks typically hark to classic use of repoussé while the same skill may be utilized to create more contemporary forms. Joinery refers to the assembly of the various elements. Design dictates whether joints or attachment points must be inconspicuous or be refined as a critical element. The most common hot technique is welding, which can be done the traditional way at the forge or by using electrical TIG or MIG techniques. Brazing or soldering may also be contemplated. Other joinery techniques involve the use of screws and rivets or methods such as tenoning, collaring and wrapping. The type of joinery used may be determined by the size, placement, function and material intended for a particular element as well as design style itself.